Deepen your sense of the past at sights like Freedom Trail and Orchard House. Museum-lovers will appreciate Museum of Fine Arts and The Paul Revere House. Get out of town with these interesting Boston side-trips: Walden Pond State Reservation (in Concord) and Dolphin & Whale Watching (in Gloucester). And it doesn't end there: admire all the interesting features of Fenway Park, explore the different monuments and memorials at Mount Auburn Cemetery, and take in nature's colorful creations at Boston Public Garden. To find maps, traveler tips, and tourist information, read our Boston holiday maker site . Winnipeg, Canada to Boston is an approximately 9.5-hour flight. You can also drive. You'll lose 1 hour traveling from Winnipeg to Boston due to the time zone difference. Expect a daytime high around 22°C in May, and nighttime lows around 11°C. Wrap up your sightseeing on the 28th (Tue) to allow time to ride a ferry to Provincetown. Museum-lovers will appreciate Pilgrim Monument & Provincetown Museum and Provincetown Art Association and Museum. 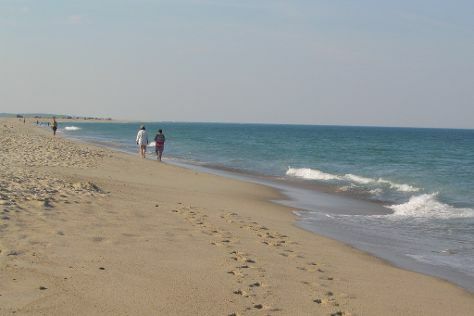 Take a break from the city and head to Cape Cod National Seashore and Race Point Beach. Go for a jaunt from Provincetown to Eastham to see Captain Penniman House about 44 minutes away. Next up on the itinerary: stroll through Cape Cod Rail Trail, get a sense of history and politics at Provincetown Town Hall, and kick back and relax at Herring Cove Beach. To find photos, traveler tips, other places to visit, and tourist information, refer to the Provincetown trip maker . Traveling by ferry from Boston to Provincetown takes 1.5 hours. Alternatively, you can fly; or drive. In May, plan for daily highs up to 20°C, and evening lows to 10°C. Wrap up your sightseeing on the 31st (Fri) early enough to drive to Falmouth. Falmouth is a town in Barnstable County, Massachusetts, United States; Barnstable County is coextensive with Cape Cod. Start off your visit on the 1st (Sat): steep yourself in history at Captain Bangs Hallet House Museum, then steep yourself in history at Edward Gorey House, then examine the collection at Heritage Museums & Gardens, and finally grab your bike and head to Shining Sea Bikeway. Get ready for a full day of sightseeing on the 2nd (Sun): get curious at Sandwich Glass Museum, then admire the masterpieces at Highfield Hall & Gardens, then admire all the interesting features of Cornelia Carey Sanctuary (The Knob), and finally enjoy the sand and surf at Old Silver Beach. To find traveler tips, reviews, ratings, and tourist information, use the Falmouth trip itinerary planner. Traveling by car from Provincetown to Falmouth takes 2 hours. Alternatively, you can take a bus. In May, plan for daily highs up to 21°C, and evening lows to 9°C. Wrap up your sightseeing on the 2nd (Sun) early enough to drive to Newport. Start off your visit on the 3rd (Mon): view the masterpieces at Thames Glass, then appreciate the extensive heritage of Ocean Drive Historic District, then see the interesting displays at The Breakers, and finally trek along Cliff Walk. Keep things going the next day: take in nature's colorful creations at Blithewold Mansion, Gardens & Arboretum, then admire the majestic nature at Colt State Park, and then admire the majestic nature at Beavertail Lighthouse and Park. To see ratings, traveler tips, where to stay, and other tourist information, you can read our Newport day trip planning website . You can drive from Falmouth to Newport in 1.5 hours. Alternatively, you can take a bus; or do a combination of bus and train. Expect a daytime high around 26°C in June, and nighttime lows around 17°C. Cap off your sightseeing on the 4th (Tue) early enough to go by car to Ogunquit. Kick off your visit on the 5th (Wed): take in the dramatic natural features at Perkins Cove, then appreciate the extensive heritage of Marginal Way Walkway, and then enjoy the sand and surf at Ogunquit Beach. To see other places to visit, where to stay, ratings, and more tourist information, use the Ogunquit trip itinerary planner. Traveling by car from Newport to Ogunquit takes 3 hours. Alternatively, you can take a bus; or do a combination of bus and train. Traveling from Newport in June, Ogunquit is a bit cooler at night with lows of 13°C. Finish your sightseeing early on the 5th (Wed) so you can drive to Bar Harbor. Bar Harbor is a town on Mount Desert Island in Hancock County, Maine, United States. On the 6th (Thu), explore the wealth of natural beauty at Acadia National Park. Get ready for a full day of sightseeing on the 7th (Fri): examine the collection at The Seal Cove Auto Museum, then step off the mainland to explore Mount Desert Island, and then trek along Champlain Mountain & Beehive Loop Trail. To find traveler tips, more things to do, photos, and more tourist information, use the Bar Harbor trip itinerary planner . Traveling by car from Ogunquit to Bar Harbor takes 4 hours. Alternatively, you can do a combination of bus and flight; or do a combination of bus, flight, and car. While traveling from Ogunquit, expect a bit cooler days and about the same nights in Bar Harbor, ranging from highs of 23°C to lows of 13°C. On the 8th (Sat), wrap the sightseeing up by early afternoon so you can travel back home.